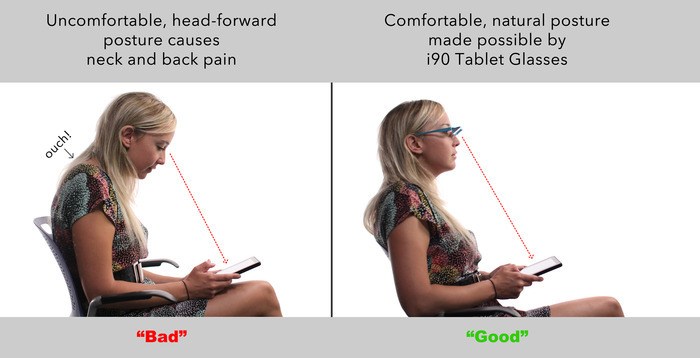 A new Kickstarter project named i90 Tablet Glasses is a pair of glasses optimised for tablet and smartphone usage, allowing users to see down without having to tilt their head forward into an uncomfortable position. The idea behind the i90 glasses is to make it comfortable to use your tablet and smartphones, anytime, anywhere. 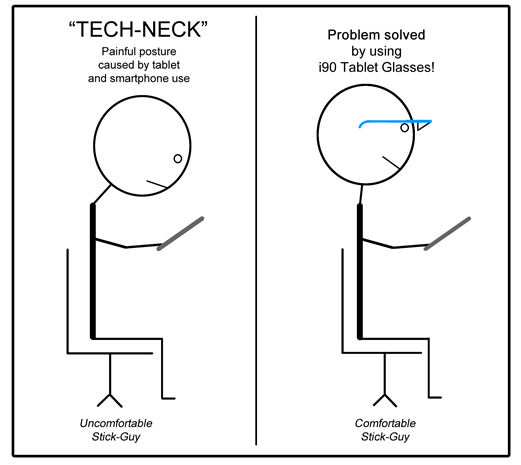 The developers note that since the head-forward ‘tech-neck’ position causes pain and even injury in worst cases, they came up with i90 glasses, which enable you to enjoy your tablet and smartphone for hours with your head up straight, looking forward. Just put these on like you would a normal pair of glasses, and you’re good to go. You’re sightline will be refracted 90 degrees downward, hence the name ‘i90’. The glasses have also been designed to be wide at the front to accommodate most reading glasses. So far, the project has raised nearly $8,000 of its $45,000 goal with 35 days still to go. If you’d like to make a pledge ($75 or more), simply head over to their Kickstarter page.